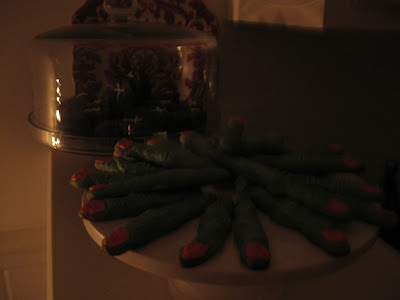 This Halloween was filled with spooky, creepy and scary things all around! 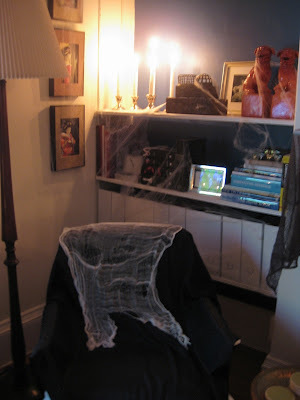 My Halloween party was great and went off without a hitch, everyone had a fun time and kept saying how amazing the decorations were- thank you friends! 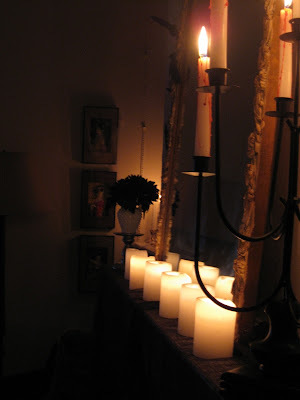 We didn't have one light on in the whole apartment, just candles everywhere. 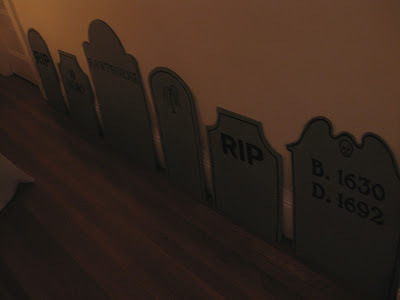 Along the hall were the gravestones I made from foam core. I used names and dates from the Salem Witch Trials. 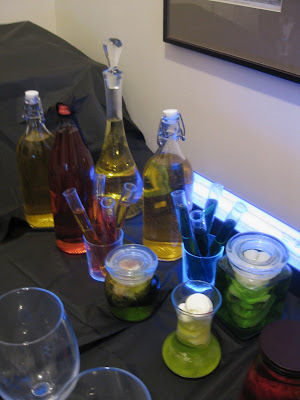 The bar was set up in the office (yes I cleaned up his mess finally) and I made it to look like a laboratory. 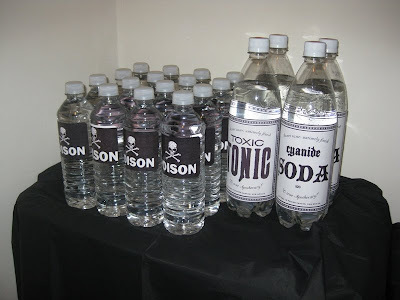 Water, tonic and club soda bottles got mini makeovers to go along with the theme. Every frame I had in the house that could be switched out was. 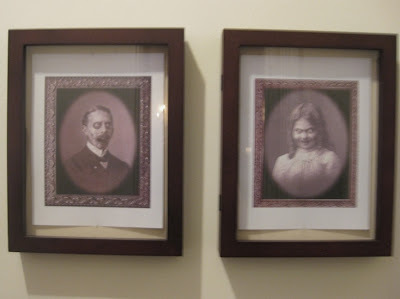 I found creepy portraits, antique insect sketches and lots of fun things on the internet. These two scary people were in the bar area. A close up of the lab. I took old jars filled them with colored water and cleaned out my fridge of old food items to put in the jars. A black light behind made them all glow. 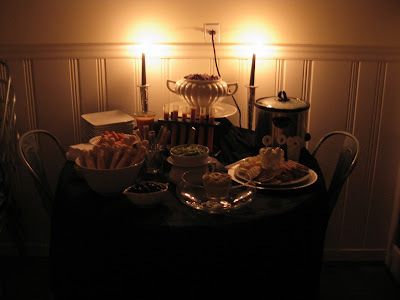 The food table set up in the kitchen. 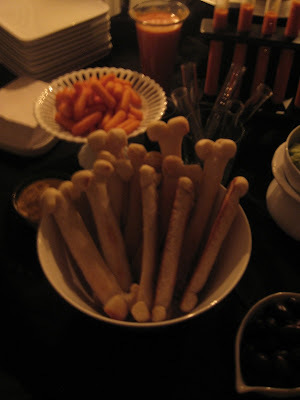 Breadsticks shaped like bones and tomato soup shooters to look like blood in the test tubes were front and center. 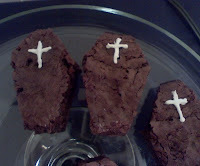 For dessert I made monster finger cookies and brownies in the shape of coffins. Of course like everything that takes planning the night went by so fast and all that hard work for months before was over in a few short hours. But it was so worth it and I would do it again in a heartbeat- I love any excuse to go all out and over the top. 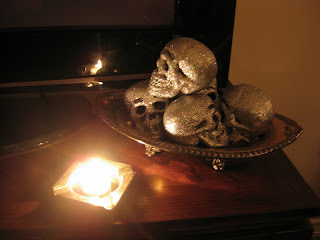 I hope you all had a fabulous Halloween!! Wow! Everything came out awesome. Eddie Ross would be so proud. 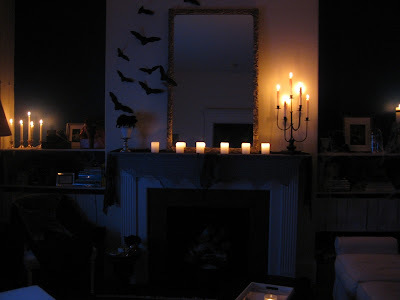 :-) I love the bats flying above the mantle and the gravestones. I'm sure your guests had a blast! i agree with laura...you totally put your ed ross on. where is the pic of your costume though???? Wow--you really went all out! Looks like it was a fun party. I LOVE your decor and treats! Amazing. 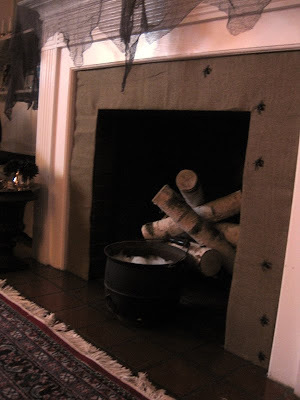 What a fun party you put together !Love the fireplace cauldron with the black cheese cloth idea. Lab so fun for drinks with the black light. 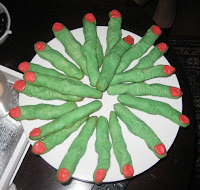 Also great monster finger cookies. That is great, I wish I was there. I can't believe all the details you thought about, fantastic! This is seriously amazing - it looks like it could have been done by Martha Stewart and Eddie Ross!! I bet your friends had a blast. Thank you everyone for such sweet comments! 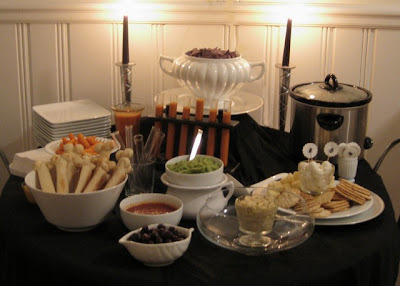 Wow, you went all out for your party! Looks great - love the details! Amazing. LOVE the water/tonic bottles, bar and food - SO FUN! You are incredible. Every single little detail is amazing. LOVE, LOVE, LOVE. Wow, all of this looks amazing! YOU ARE THE QUEEN OF HALLOWEEN!!!! oh my goodness how awesome!! you just ghot everythign down to the tiniest detail!!! i lvoe the lab idea & also switching out to creepy pics!!! hahahah so so great!!! glad it was so much fun!!!! Awesome! 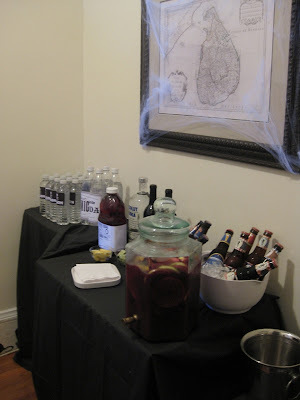 I'm so impressed with your party planning expertise and creative ideas- well done! Can I come next year?! you really were up to your eyeballs in Halloween! looks great! OMG this is so totally awesome! I love it!! Way better than I'd ever think of on my own. 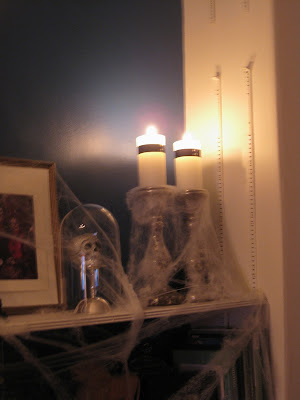 Especially love the mantle. So fun! You did a FANTASTIC job with the decorations! Your party looked awesome. 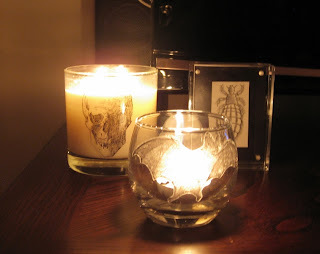 Loved the design you used on the tonic bottles and those spooky portraits you used. Great job! OMGOSH!! Your party looks so Wonderful! You did an amazing job. I can only imagine how many hours the whole process took!! I bet your guests LOVED it!! So darn cute! You did a great job!!! oh how fun!!!! happy late birthday!